9.16.11 Revisiting flexitarian cooking for my pregnant vegetarian sister-in-law! When I co-wrote The Flexitarian Table with chef Peter Berley a few years ago, I was coming from the perspective of a long-time vegetarian who had recently begun eating some meat. The cookbook presents a few different approaches to the veg-meat spectrum, from eating mostly produce with a bit of meat here and there for flavor to cooking for vegetarians and meat eaters at the same time to produce meals that are separate yet equal. I love Berley’s cooking and learned so much from the project. Last weekend, visiting my sister- and brother-in-law in Asheville, NC, I revisted Flexitarianism, since my sister-in-law is a vegetarian (and 8 months pregnant, whee!) and my brother-in-law is a meat-a-tarian. It was an occasion to realize how much parenthood has changed our diets: we eat meat regularly now, because it’s one of the easiest protein sources to tempt Leo with. He won’t touch beans or tofu, so we tend to make about two dairy dinners, one egg dinner and one fish dinner per week. The rest of the time, it’s often chicken, ground grass-fed beef or pastured pork, or sausage. Cooking flexitarian was a pleasure after hitting the Asheville farmer’s market, which is a little ahead of ours season-wise. 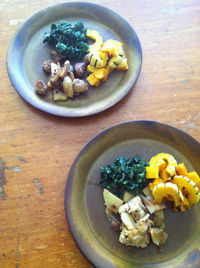 We ended up having a nice fall-looking dinner with tempeh for some and sausage for others. I had both.